​to fit your life and grilling style. we will regularly contact you when it's time to schedule a visit. Fire oxidizes (rusts) all metals, even stainless steel! Eventually parts need to be replaced. We bring many parts with us to your grill, but if we don't have the part you need we can order it for you or tell you where you can find it at the best price. See below for tips to keep your grill in good shape. 1) Get a durable cover for your grill and use it every time you are done grilling and the barbecue is cool. This will extend the life of your grill and it's parts. 2) Don't overheat your grill to clean it. Your barbecue is not a self-cleaning oven. Over-exposure to heat will damage parts and eventually destroy your grill. Instead, follow the next tips to safely maintain a clean, well-operating grill that lasts. 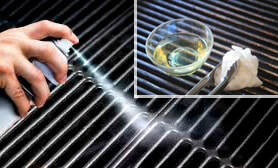 3) Every time you finish grilling, after you've turned off the gas and while grill is still hot, coat the cooking area with a light application of vegetable oil either by spray or brush, then thoroughly brush off the cooking surface with a wire brush (longer bristles get between things.) The hot oil softens and loosens the stuck food, and leaves a protective coating on the cooking grates. To season the grates, coat with oil and cook on medium heat -not high- for about 15 minutes, or until oil solidifies. Make sure to turn the grill off after no more than 20 minutes. ​Using a kitchen timer will help remind you not to leave your grill burning overnight. 4) Every 5 times you grill, brush and inspect under the cooking surface and heat plates/briquettes. When your grill is cool, remove the cooking grid and brush/scrape your flame-tamers or briquette trays. This can be done with a small wire brush and a putty knife. ​Then, lift out those trays and inspect your burners. Look for the holes that emit the gas and produce your flames. If any are obstructed, use the small wire brush to remove obstructions and deposits on the burners. If stubborn clogs are present, a sharp metal object (such as a paper clip or small drill bit ) may be used to pierce the deposit and open clogged holes. Use a tool close to the size of the fully-open holes. (While you're there, consider using a shop vac to remove debris at the bottom of your grill and from your heat trays.) ​Then reassemble the trays and cooking grid. You'll cook better now. OK for charcoal grills but NOT OK for gas grills – DON'T DO THIS ON YOUR GAS GRILL - THE SAUCE WILL DRIP DOWN TO BURNERS! 5) Don't pour sauces onto your meat while on the grill. Excess sauces find their way to the burners, clogging and corroding them with salts. You can't grill with clogged burners. Instead, coat or marinate your meats in the kitchen, remove from the marinade to a separate dish, and then place them on your hot barbecue. Your grill will thank you with a longer and more reliable life. If you must add sauce to your meats on the grill, just add a light coating, not enough to drip. Then close the grill and turn the fire low, or off, to let the ambient heat of the grill gently heat the sauce. If you notice your grill's performance diminishing, call us with your concerns at 925-899-7983. Some problems could be evidence of part failure, and may even be dangerous. For bbq cleaning, bbq repair, grill cleaning, grill repair, barbecue cleaning, barbecue repair, grill repair, grill cleaning, gas grill, outdoor kitchen, outdoor firepit, patio heater.